Bunk beds have been the ultimate space savers for parents for a long time. You don’t need to have a separate room for each child, nor do you have to take up all your floor space with multiple beds. You just need to get bunk beds and take advantage of the vertical space to sleep everyone. But even a bunk bed can take up more floor space than you have in a small room. Hidden vertical Murphy bunk beds can help you create the sleeping space you need without taking up more square footage than you have to give. Murphy beds have a mattress on a hydraulic lift so that you can fold up the bed against the wall when you are not sleeping. Typically, the lift is hinged near the bottom of the wall, and the foot of the mattress lifts up and ends up at the top of the cabinet. The bed looks like a cabinet or wall panel when it is not in use, and the floor is completely free for other uses. 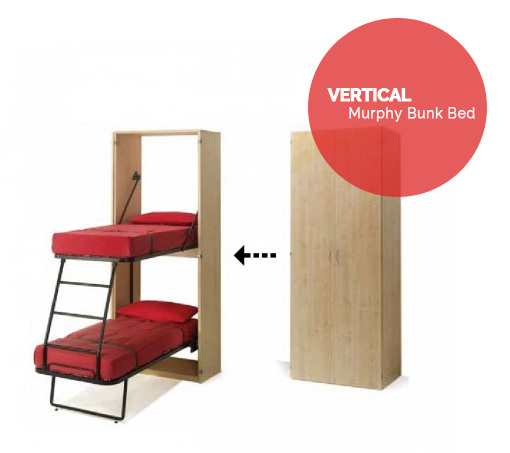 With hidden vertical Murphy bunk beds, you get two beds stacked on top of each other. The mattresses are each on their own lift. The lower mattress has a metal bar for support, and the upper mattress is connected to the ladder, which is connected to the lower mattress for support. You put the beds away starting with the upper mattress. It lifts up and then slips down into the cabinet in a vertical position, and the ladder folds flat against it. The lower mattress then folds up against the other, just like a traditional Murphy bed. The mattresses are stacked against each other, creating a thicker cabinet than traditional Murphy beds. Just close the cabinet doors and the whole thing looks like a wardrobe or a storage cabinet, and it takes up only as much space. You can also get the look you want for your bunk beds, ensuring that you create a stylish space while also conserving square footage. 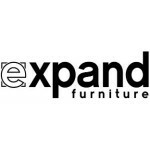 You can get the bed frame and cabinet in a variety of wood finishes, such as maple, white oak, walnut, and cherry. These natural wood finishes create a warm look. If you prefer something more modern, choose a simple white finish that can be paired with a variety of other colors and patterns. When the bed is stowed away, the cabinet face is what will show to the room. You can also customize the front of the cabinet by picking out colorful panels. Some options include bright colors like red, blue, orange and yellow, as well as more muted towns like seafoam and taupe. Imagine the possibilities with the combination of wood finishes and panel colors. You can put these bunk beds in your children’s rooms to free up more space to play, or you can put them in a guest room to make sleepovers and visits from out-of-town relatives a little easier. 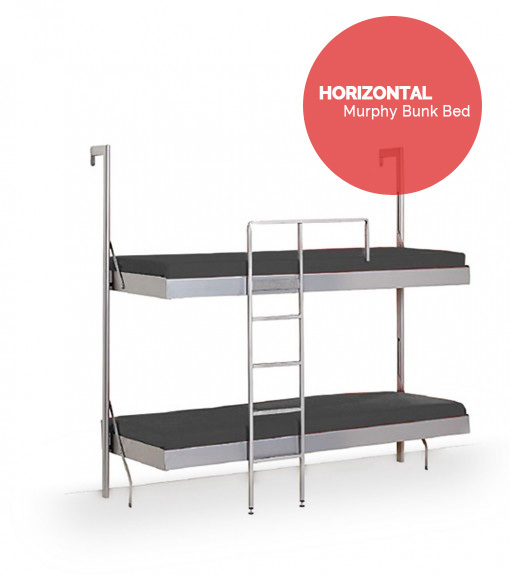 You can also buy Murphy bunk beds that have a horizontal design. These beds are mounted to a metal frame that is mounted to the wall. A sturdy bracket attaches to the mattress platform. The bracket also allows the platform to hinge up and tilt in toward the wall. The mattresses stack on top of each other lengthwise. Hidden vertical Murphy bunk beds offer more advantages than horizontal Murphy bunk beds. The vertical design takes up much less wall space and offers more options for positioning in the room. You can fit the beds between two windows, between the door and the wall, and between dressers. The vertical beds take up just as much vertical space as the horizontal beds, but they take up much less horizontal space. 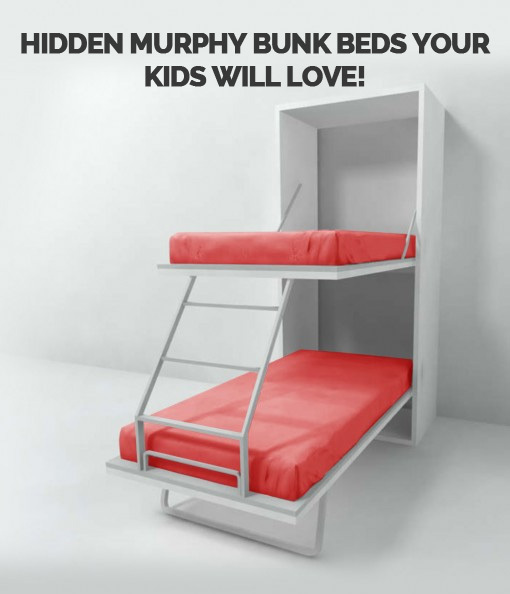 You’ll get maximum space-saving benefits from hidden vertical Murphy bunk beds. Expand Furniture sells high-quality hidden vertical Murphy bunk beds that you can customize to your taste. We also sell horizontal Murphy bunk beds, as well as traditional Murphy wall beds in a variety of sizes that can be paired with sofas, cabinets, and shelves. 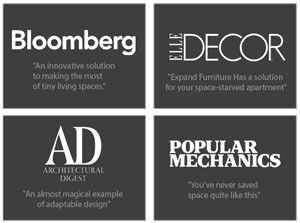 Our catalog offers a variety of space-saving furniture options that help you maximize the space in your home while also making it more beautiful. 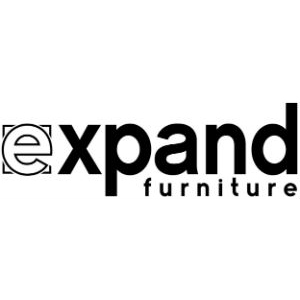 Explore our online catalog to find the beautiful, high-quality furniture that you need to make your home more spacious. 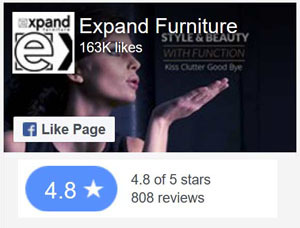 You can also check out our top-rated modern wall bed sofas to maximize the space in your living area!